With terror-stricken faces, four reputable fishermen of Bellambi, New South Wales, hopped ashore from their 18-ft fishing boat a few days ago and declared that they had seen a mammoth sea serpent. Scientists who insist on concrete proof of anything before they believe it, for centuries past have discounted the existence of sea serpents, and have regarded as liars, knaves, or fools sailors and ships captains who have from time to time reported having seen one. And this despite the further fact that an ugly monster was washed ashore as Santa Cruz (California). A few days ago four hardy fishermen of the coalmining district of Bellambi, B. Wiley, J. Lane, M. Guy, and J. Richardson, hopped ashore from an 18-ft. three-oar fishing boat, all with faces pallid with terror. A digger who had seen Gallipoli and Flanders at their worst, and who saw them when they landed, said he had never seen such terror in men’s faces in the battlefields of either. 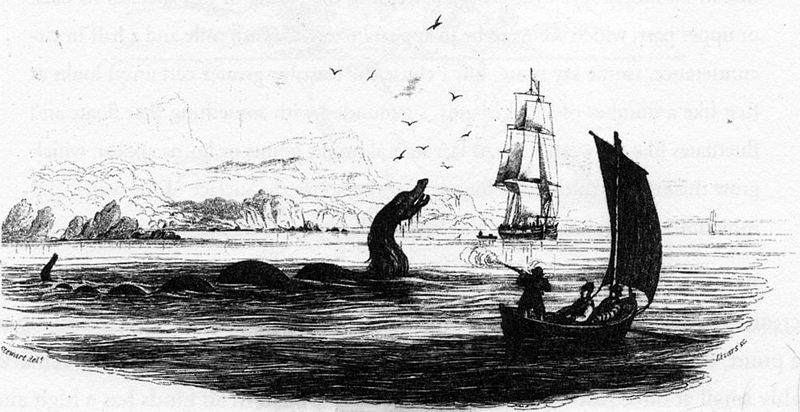 Not only did they see a mammoth sea serpent, but their boat was almost inside its huge, gaping mouth after it had actually chased them for over half a mile. Their description of the denizen when they were specially interviewed made it clear that their story was no flight of imagination; and, as Bellambi knows them all for four good men and true, from ex-Policeman K. O’Neill to the oldest inhabitant, the little coal and fishing village has no doubts as to its reality. They have every reason not to. Two years ago fishermen H. Hillier and J. Ross sighted a monster of the same description almost in the same place, less than a mile from the jetty – and were howled down on delivering their report, although three other fishermen of the district, Clark, Rigby, and Powell, lost their lives in the same locality seven years ago, when their boat was smashed to pieces my some strange monster of similar type. A serpent 60 ft. long was sighted by Capt. Charlot and the crew of the French steamer St. Francois Xavier, off Port Stephens (New South Wales) on February2, 1925 and officially logged and reported. But like the report of Capt. Austin Cooper, of the clipper ship Carlisle Castle, on a voyage from London to Melbourne in 1882, its existence did not make the land fish scientists change their minds. August 6: Lat. 24.44 S., Long. 9.22 E. It was an enormous serpent, with head and shoulders; kept about four feet above the surface. At least about 60ft. of the animal was a fleur d’eau. . . .It passed rapidly, but so close under our lee quarter that if it had been a man of my acquaintance I should easily have recognised his features with the naked eye. Soon after a similar ocean monster with a dragon’s head was reported by Capt Trelawny, of the British brig Daphne, in waters not far away. In each case reported the description of the sea serpents, except in minor details, strangely synchronises. The Bellambi denizen’s described characteristics being practically the same as that of the first officially reported. Anyway the Bellambi men are not looking for another in a hurry. The Mail (Adelaide, SA) Saturday 21 June 1930.